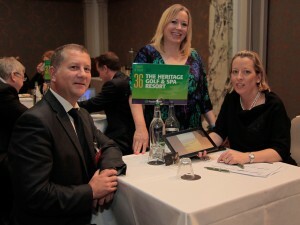 Tourism enterprises from around Ireland (including the Heritage Golf & Spa Resort, Killenard, travelled to London to take part in this year’s Flavours of Ireland. The B2B tourism workshop, organised by Tourism Ireland, saw 100 representatives of the top GB-based inbound tour operators come together to do business with 41 Irish tourism organisations. Gráinne O’Malley, The Heritage Golf & Spa Resort, Killenard (right); Graham Howatson, Go Europe Travel, based in Liverpool; and Breige Coward, Tourism Ireland, at the Flavours of Ireland 2013 workshop in London, organised by Tourism Ireland. arrangements for holidaymakers to GB and Ireland from all over the world, this event was an excellent opportunity for the participating Irish tourism providers to highlight their product to these important decision-makers and to encourage them to include the island of Ireland in their future holiday programmes. Jim Paul, Tourism Ireland’s head of Australia & Developing Markets, said:“Tourism Ireland is delighted that so many tourism organisations from around the island of Ireland and so many of the leading GB-based tour operators took the time to join us at our ‘Flavours’ event again this year and we very much welcome the business and networking opportunities it presented. Our aim is to increase awareness of the island of Ireland among these hugely influential tour operators and to help Ireland and our tourism partners secure a greater share of the huge worldwide tourism market.